t*rexes and tiaras: Magic, madness, heaven, sin.. I sometimes feel as though I ought to start a series called Char tries to make something which doesn't turn out like it did in her head, as it would pretty much apply to everything I ever make. Here's the latest which would fall into that category. 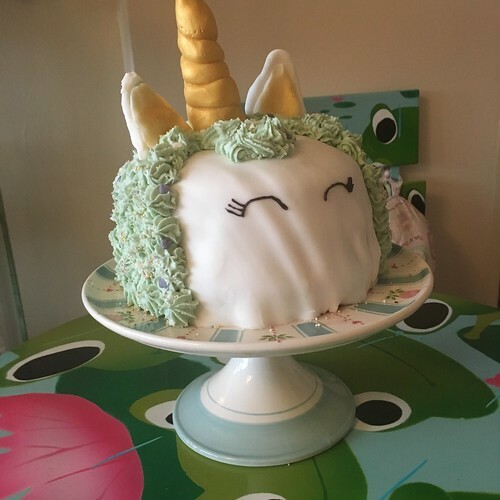 My friend's daughter asked if I'd make her a birthday cake for her birthday party at the weekend and being firmly of the opinion that time is an elastic concept, I assured her I would. She didn't give me a lot to go on, tbh, just that her favourite cake is chocolate and the party was due to have a girly theme. So, I came up with a shortlist of ideas, mostly using google image search, then dismissed the ones I reckoned I wouldn't be able to emulate. In the end, I decided that a unicorn would be relatively simple. Um. After a little bit of panic, I ended up with three layers of chocolate sponge, put together with layers of chocolate buttercream and seedless strawberry jam. 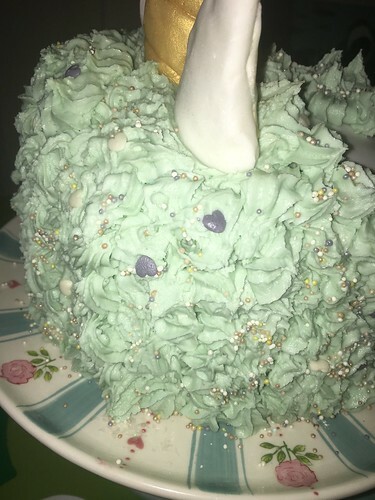 And then kind of went crazy with some minty green butter icing and as many different edible sparkles as I could find for the mane. 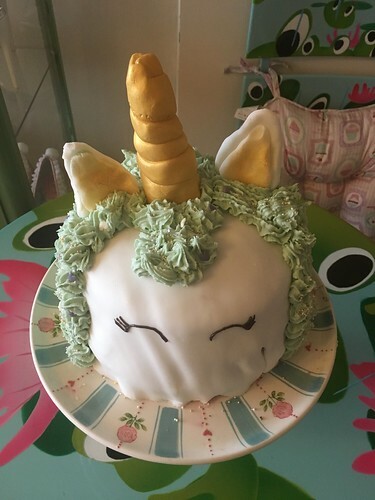 I shaped some primitive ears and a unicorn horn from fondant icing, and built up some layers of gold icing spray for the colour of the inner ears and horn. Attached them with some more butter icing, and piped on some eyelashes and was good to go. Hopefully it was clear that it was supposed to be a unicorn. Definitely a unicorn! I'm sure it was delicious.